Capelle Associates (1999). “Optimizing Organization Design: Improvements in Manager–Direct Report Alignment, Financial Performance and Employee Satisfaction.” Capelle Associates Research Paper #1. In R. G. Capelle (2014), Optimizing Organization Design. San Francisco: Jossey-Bass. Capelle Associates (2000a). 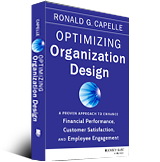 “Optimizing Organization Design: Improvements in Organization Design and Employee Satisfaction.” Capelle Associates Research Paper #2. In R. G. Capelle (2014), Optimizing Organization Design. San Francisco: Jossey-Bass. Capelle Associates (2000b). “Optimizing Organization Design: Improvements in Manager–Direct Report Alignment, Employee Satisfaction and Customer Satisfaction.” Capelle Associates Research Paper #3. In R. G. Capelle (2014), Optimizing Organization Design. San Francisco: Jossey-Bass. Capelle Associates (2000c). “Optimizing Organization Design: Improvements in Manager–Direct Report Alignment and Employee Satisfaction.” Capelle Associates Research Paper #4. In R. G. Capelle (2014), Optimizing Organization Design. San Francisco: Jossey-Bass. Capelle Associates (2000d). “Optimizing Organization Design: Improvements in Manager–Direct Report Alignment, Leadership and Direction, and Employee Commitment.” Capelle Associates Research Paper #5. In R. G. Capelle (2014), Optimizing Organization Design. San Francisco: Jossey-Bass. Capelle Associates. (2000e). “The Information Processing Capability of an Employee and the Job Grade of a Position: Is There A Relationship?” Capelle Associates Research Paper #6. In R. G. Capelle (2014), Optimizing Organization Design. San Francisco: Jossey-Bass. Capelle Associates. (2000f). “Information Processing Capability, Time Span and Job Grade.” Capelle Associates Research Paper #7. In R. G. Capelle (2014), Optimizing Organization Design. San Francisco: Jossey-Bass. Capelle Associates (2003a). “Appropriateness of Compensation, Overall Employee Satisfaction, and Employee Satisfaction with Compensation: Review of 20 Organizations.” Capelle Associates Research Paper #8. In R. G. Capelle (2014), Optimizing Organization Design. San Francisco: Jossey-Bass. Capelle Associates (2003b). “Organization Design, Manager–Direct Report Alignment and Organization Performance in Canadian Private Sector Companies: Results from Surveys of CEOs and Heads of Human Resources.” Capelle Associates Research Paper #9. In R. G. Capelle (2014), Optimizing Organization Design. San Francisco: Jossey-Bass. Capelle Associates (2004a). “Task Alignment: A More Micro Organization Alignment Approach.” Capelle Associates Research Paper #10. In R. G. Capelle (2014), Optimizing Organization Design. San Francisco: Jossey-Bass. Capelle Associates (2004b). “Equitable Differential Pay Scale for the Canadian Market.” Capelle Associates Research Paper #11. In R. G. Capelle (2014), Optimizing Organization Design. San Francisco: Jossey-Bass. Capelle Associates (2005a). “Relationship between Time Span, Compensation Span and Actual Compensation: Review from 57 Organizations.” Capelle Associates Research Paper #12. In R. G. Capelle (2014), Optimizing Organization Design. San Francisco: Jossey-Bass. Capelle Associates (2005b). “Organization Design: From Improvement to Decline.” Capelle Associates Research Paper #13. In R. G. Capelle (2014), Optimizing Organization Design. San Francisco: Jossey-Bass. Capelle Associates (2005c). “Manager–Direct Report Alignment is Directly Related to Employee Satisfaction: Review of 30 Organizations.” Capelle Associates Research Paper #14. In R. G. Capelle (2014), Optimizing Organization Design. San Francisco: Jossey-Bass. Capelle Associates (2011). “Organization Design, Manager–Direct Alignment and Employee Satisfaction.” Capelle Associates Research Paper #15. In R. G. Capelle (2014), Optimizing Organization Design. San Francisco: Jossey-Bass. Capelle Associates (2012a). “Manager–Direct Report Alignment, Delegation and Compensation from Capelle Associates Benchmarking Database.” Capelle Associates Research Paper #16. In R. G. Capelle (2014), Optimizing Organization Design. San Francisco: Jossey-Bass. Capelle Associates (2012c). “Relationship among Time Span, Self Span and Compensation Span from Capelle Associates Benchmarking Database.” Capelle Associates Research Paper #18. In R. G. Capelle (2014), Optimizing Organization Design. San Francisco: Jossey-Bass. Capelle Associates (2012d). “Relationship among Manager–Direct Report Alignment, Delegation, and Compensation from Capelle Associates Benchmarking Database.” Capelle Associates Research Paper #19. In R. G. Capelle (2014), Optimizing Organization Design. San Francisco: Jossey-Bass. Capelle Associates (2012e). “Span of Control and Employee Satisfaction from Capelle Associates Benchmarking Database.” Capelle Associates Research Paper #20. In R. G. Capelle (2014), Optimizing Organization Design. San Francisco: Jossey-Bass. Capelle Associates (2012f). “Manager–Direct Report Alignment and Employee Satisfaction for an Analyst Role.” Capelle Associates Research Paper #21. In R. G. Capelle (2014), Optimizing Organization Design. San Francisco: Jossey-Bass. Capelle Associates (2012g). “Manager–Direct Report Alignment and Employee Satisfaction in Three Organizations.” Capelle Associates Research Paper #22. In R. G. Capelle (2014), Optimizing Organization Design. San Francisco: Jossey-Bass. Capelle Associates (2012h). “Potential Annual Cost Savings from Organization Design Assessments.” Capelle Associates Research Paper #23. In R. G. Capelle (2014), Optimizing Organization Design. San Francisco: Jossey-Bass. For others considering redesigning their organizations, I think that a strong internal - external partnership is critical. I am generally not a big believer in external consultants, but there are certain business issues and opportunities that require more specialized and independent methodology or perspective. I would put comprehensive organization design in this category, and our relationship with Capelle Associates as an example of a strong internal - external partnership that has lasted for over ten years. The strength of this partnership is based on two main factors: 1) the quality of Capelle Associates' research methodology and 2) the experience, capability, reliability and trustworthiness of the members of their firm. Under challenging timelines and resource constraints, Capelle Associates have never missed a deadline or commitment.